Who remembers the film Big staring the very fabulous (but very young then) Tom Hanks, hands up. Well, do you also remembe the scene in the toy department of the store where he played the floor keyboard. Yes, you do…amazing wasn’t it. We loved that fil (still do), and we all wanted a giant keyboard on the floor jsust like that and to be so cool like Tom. Well, now we can, ahem I mean your kids can of course (sshh wait until they are asleep) with this fab offering from Dunelm. Perhaps a tad more sophisticated than Toms version but no less fun we can guarantee. 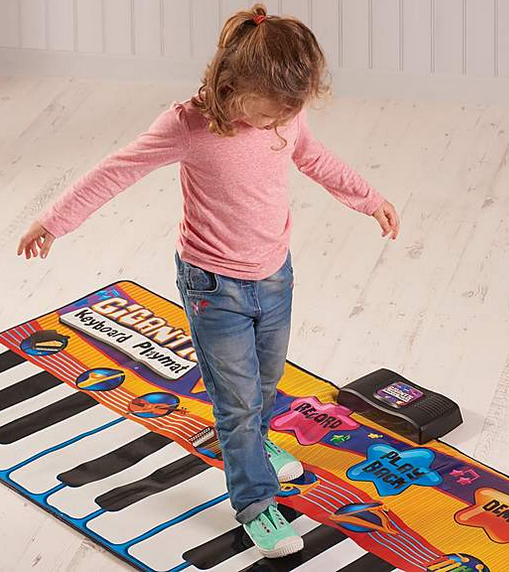 Ideal for hours of musical fun for all of the family and friends, this giant musical keyboard plays the xylophone, accordion or the guitar and features real music keys to effortlessly play your own musical tunes. Coming complete with four modes to select from and eight instruments to play, this giant keyboard makes for a great present this Christmas. A definite must for kids big and small we think! This Musical Giant Keyboard from Dunelm will set you back just £20 this Christmas, cheap as chopsticks!